ICanToo - 100% Cotton Asymmetric 3/4 Sleeve Round Neck Tunic. 100% Slub Jersey, lightly textured cotton top. The eye-catching asymmetric shape at the hem brings subtle movement with a solid color drop. Fun yet sophisticated, you will find that the longer skewed shape will flatter your figure and the subtle texture of the slub weave brings soft yet stylish comfort. The asymmetric solid accent along the bottom is unique and has a nice slimming effect while the pattern makes the beach feel like it's a stone throw away. Women's sizes in S, M, L, XL, and 2XL. Be sure to see details in Size Chart. Made in USA. 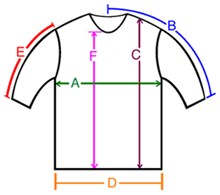 A: Chest / Bust circumference 40" 41" 45" 48" 49"
B: Sleeve length from center of neck to end of sleeve 25.5" 27" 27.5" 28" 28.5"
C: Body length from shoulder to bottom of hem point 24" 24.5" 25" 25.5" 26"
D: Hem circumference 47" 49" 50" 52" 52"
E: Sleeve length from shoulder to end of sleeve 17" 17.5" 18.5" 19" 19"
F: From the bottom of the Neck to hem point 21" 21" 22" 22" 22.5"